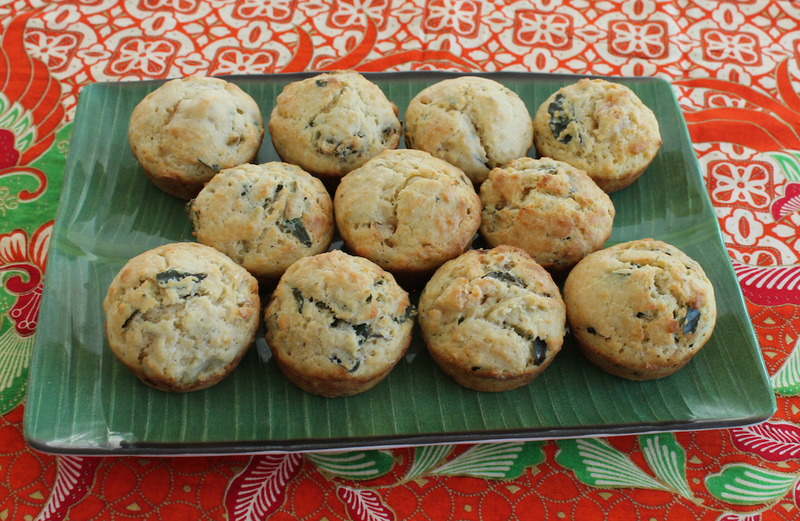 Aromatic curry leaves, fried till crispy in butter, perfectly complement the butter-fried prawns in these delicious savory muffins. I have an editorial calendar where I keep track of upcoming blog posts and what I am planning to cook or bake for different group themes. 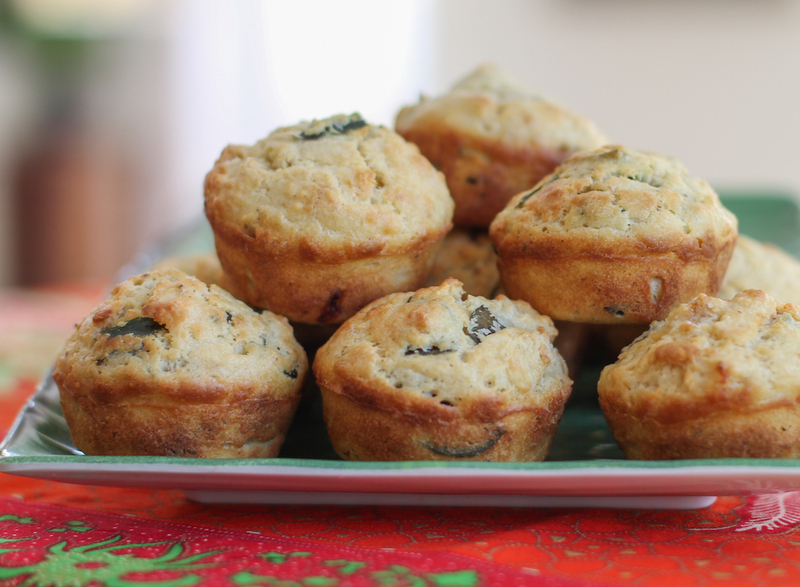 I penciled in Muffin Monday on the 22nd of February and started thinking about what to bake. 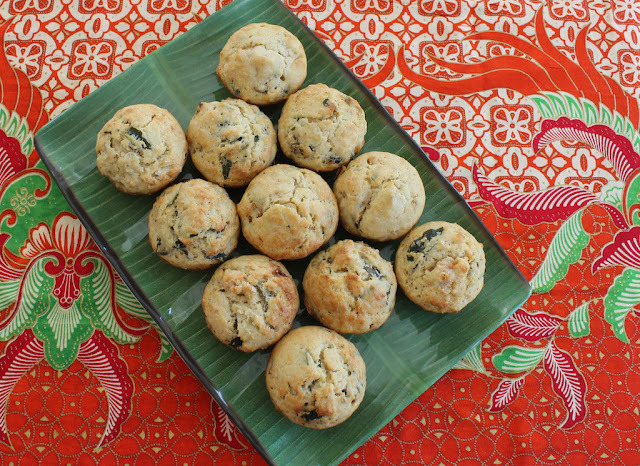 If you’ve been reading along here for a while, you know that the new Muffin Monday doesn’t have a theme or prescribed ingredients. We are free and easy on the last Monday of each month. But then I discovered that this was a leap year so the last Monday of the month is actually February 29th. How did I get all the way to the middle of February and just find that out? Seems like it would have come up at some point in December or January at least, right? Soooooo, I had an idea: A leap of faith muffin. We’d each use an unusual ingredient, one we’ve never used before, at least not in a muffin. I proposed it to the group and, good sports that they are, they all agreed. Make sure you scroll down and check out the link list of muffins. Some of them may look normal to you, but I can assure you that the Muffin Monday bakers have stretched themselves this month! 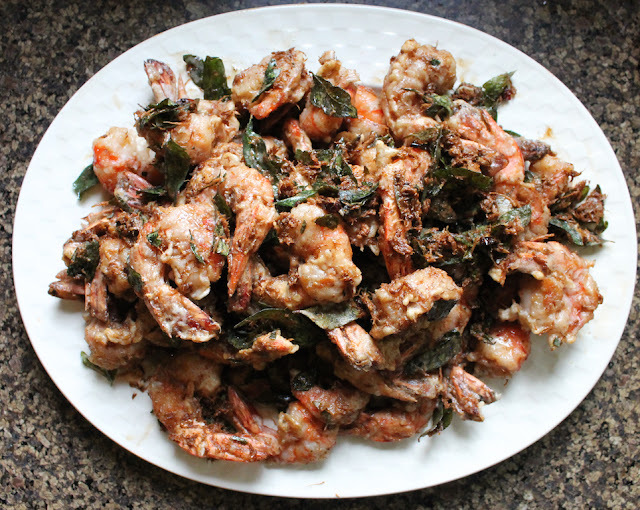 One of my favorite dishes when we lived in Malaysia was something called Butter Prawns. I’ve only made them myself once because they are a bit of a faff but, dear me, they are divine! Crispy curry leaves, crispy prawns and lots of bits of buttery crumbs. 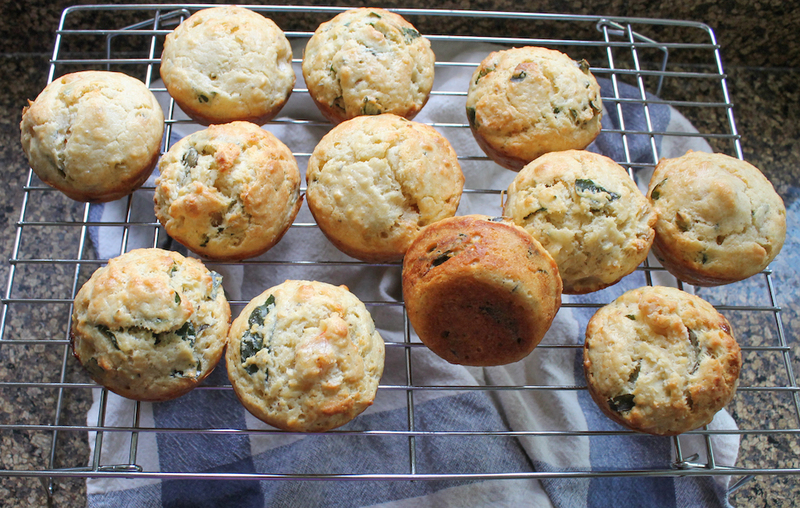 I didn’t do the crumbly part for these muffins but all the butter, curry leaves and prawns still gave me the right flavor I was looking for. 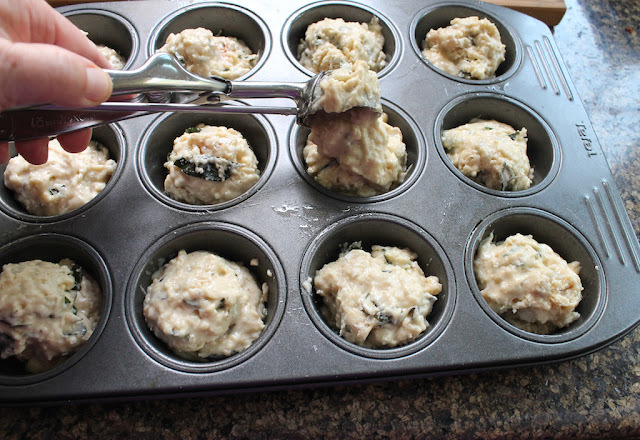 Preheat oven to 350°F or 180°C and prepare your 12-cup muffin pan by generously greasing with butter, oil or non-stick spray. 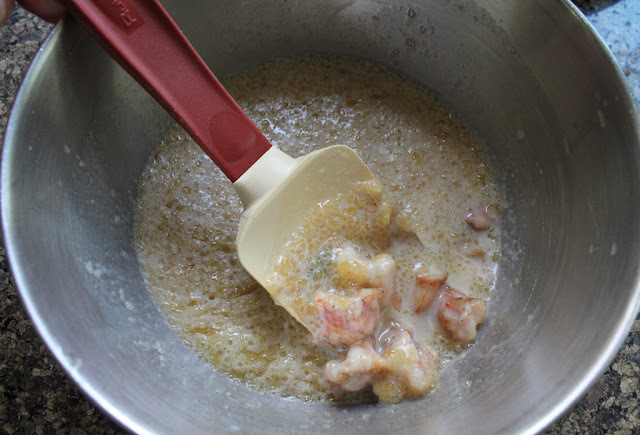 Chop the prawns into three or four pieces and put them in a bowl handy to your stove or cooktop. 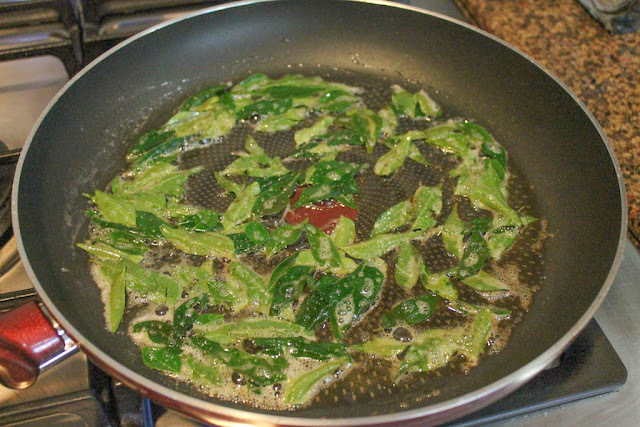 Melt two tablespoons of the butter in a small frying pan and then fry the curry leaves briefly. Remove them quickly with a slotted spoon when they get crispy and are just starting to brown. 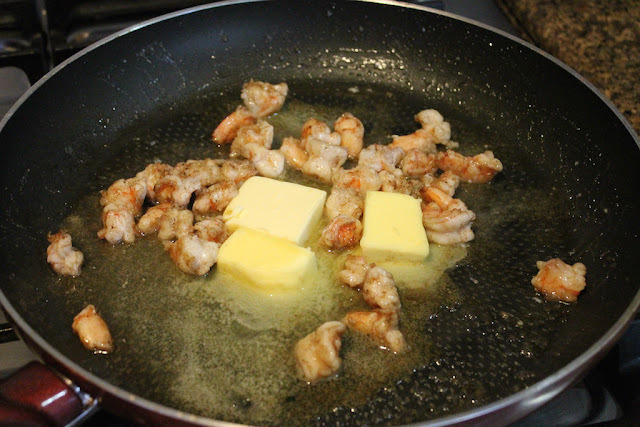 Lower the fire and tip the prawns into the browning butter you've left behind. Cook them till just pink. Remove the whole pan from the heat, add in the rest of the butter and set aside so the additional butter can melt and the prawns can cool. 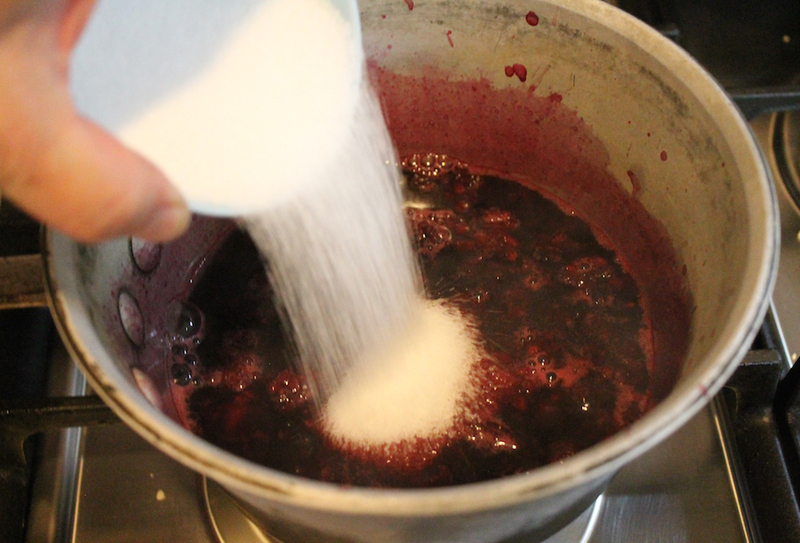 Combine flour, baking powder and salt together in a large mixing bowl with a few generous grinds of fresh black pepper. 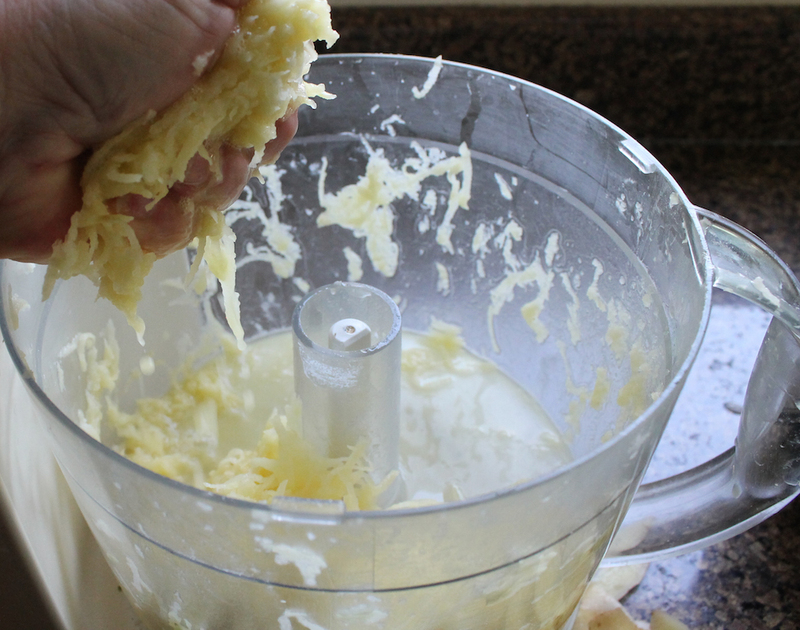 In another bowl, whisk together the milk and eggs. 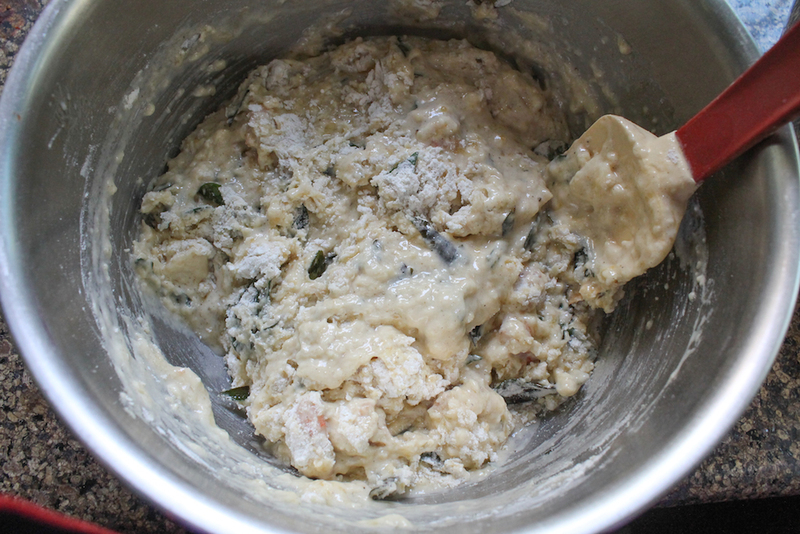 Once the prawns are cool enough not to cook the eggs, add them along with the melted butter and stir well. 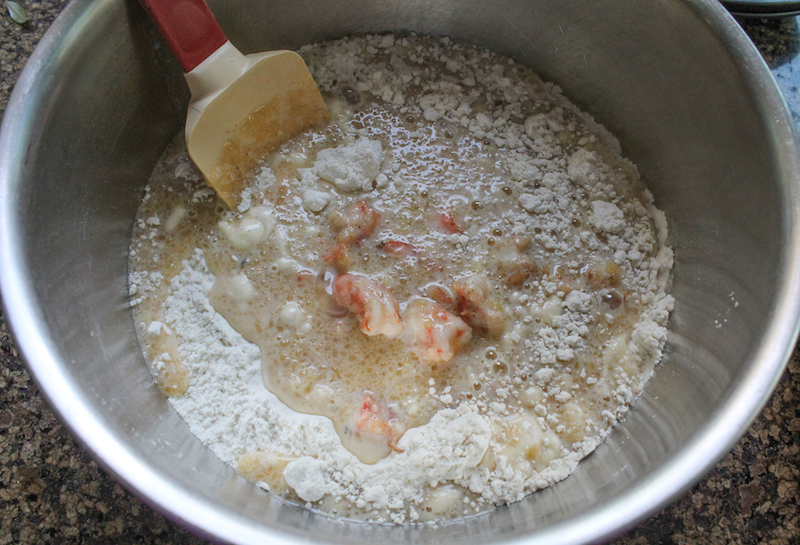 Add all the milk/egg/prawn mixture to flour bowl. Gently fold a few turns then add in the crispy curry leaves. Continue folding just until the dry ingredients are moistened. 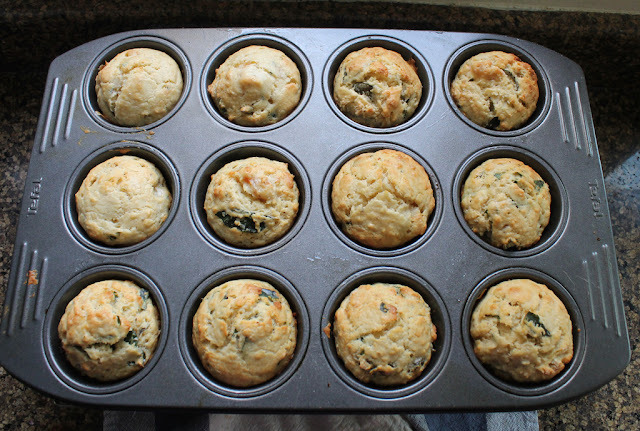 Bake in your preheated oven for 20-25 minutes or until muffins are golden. Take a leap of faith with us this month – Bake some muffins! 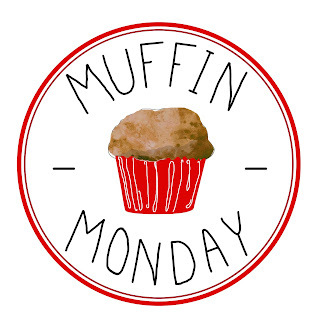 Many thanks to all the Muffin Monday bakers for playing along. 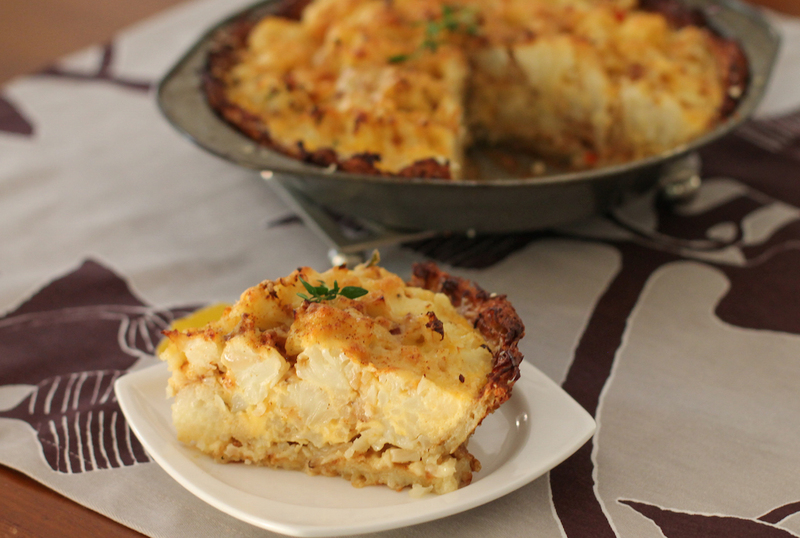 A crispy potato crust is filled with all the comfort food goodness of cauliflower and cheese, making this the perfect pie for a still chilly February evening. Or anytime really. When I was growing up, one of my favorite ways to eat cooked cauliflower was with a side of mayonnaise in which to dip it. I got some funny looks outside my home, where mayo and cauliflower was normal, a given. I thought everyone ate it that way. That winning combo was rivaled on my plate only by cauliflower with cheese sauce. 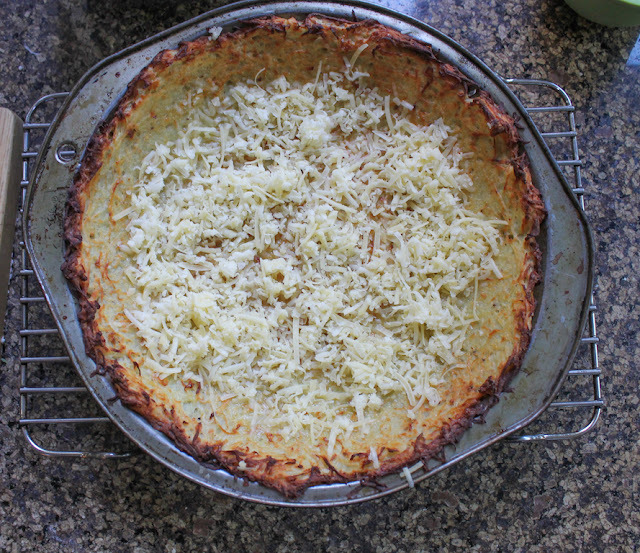 I remember one special family occasion – not sure if it was Christmas or Thanksgiving or possibly even Easter – but there was a platter of cauliflower and broccoli arranged most artistically by my youngest aunt, all smothered in thick cheese sauce. 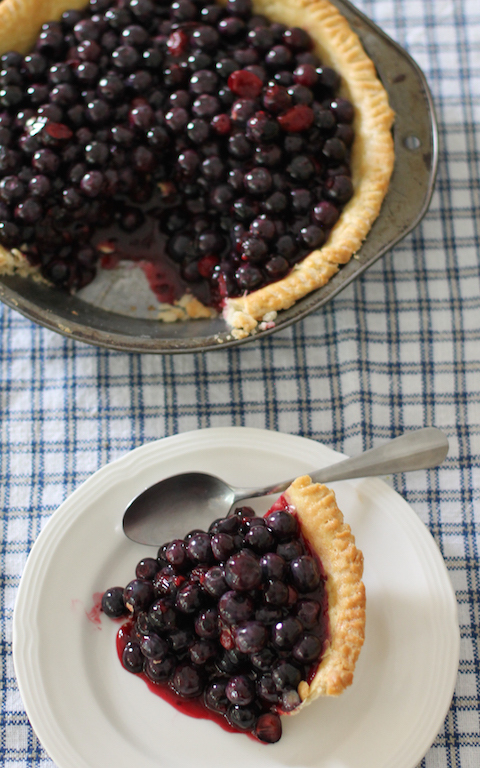 I could have eaten the whole thing by myself but had to share. More’s the pity. 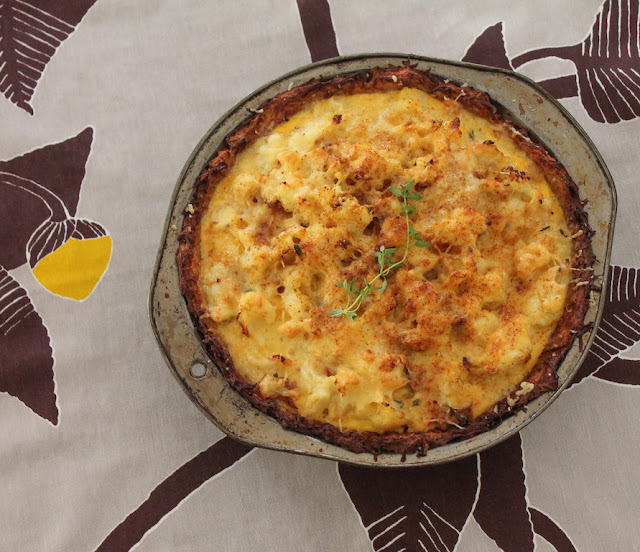 I discovered as I began to travel and learn about other cultures and traditional recipes that the British make a dish called cauliflower cheese for special occasions as well. 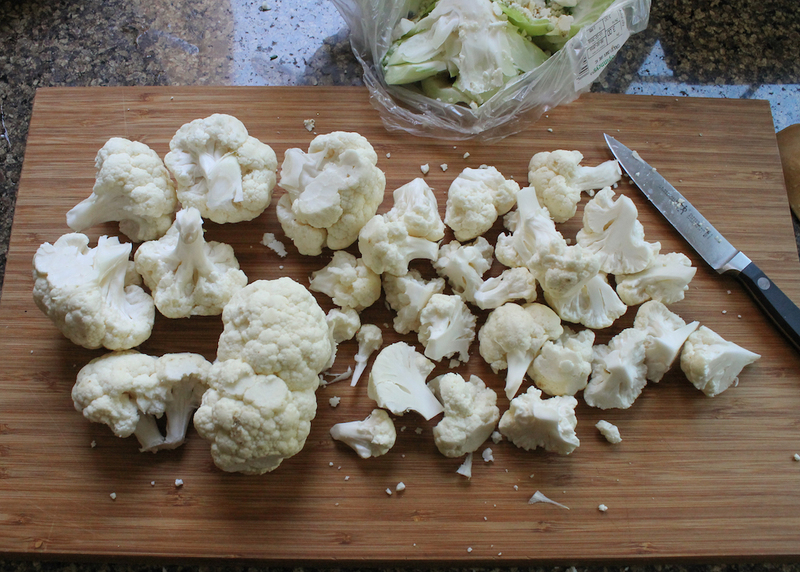 The cauliflower is steamed or boiled whole then drained. 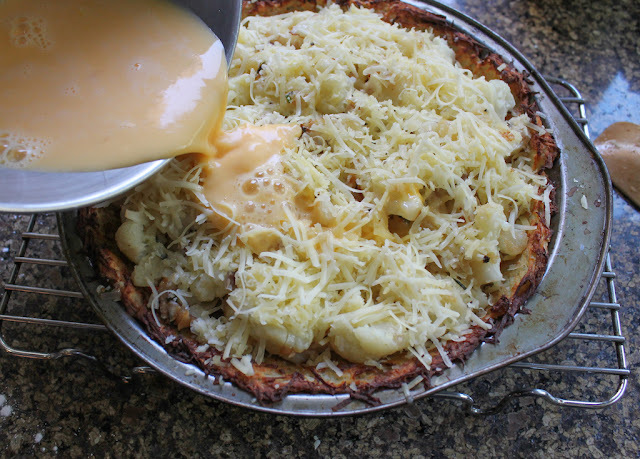 A cheese sauce is created by making a béchamel or white sauce to which sharp cheddar is added, perhaps with a little dried mustard powder. 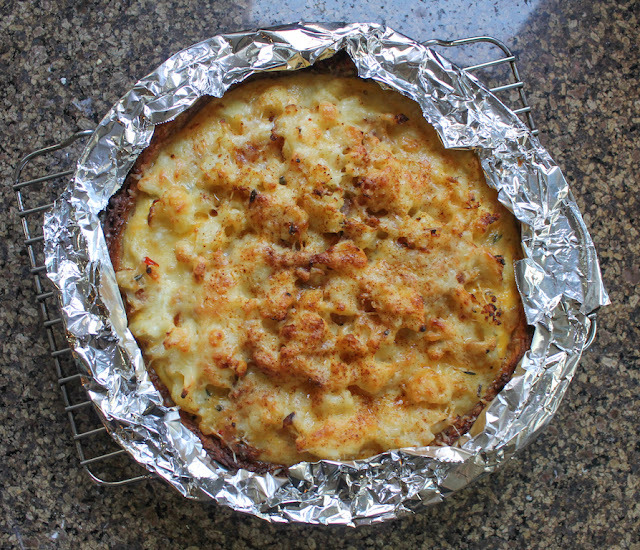 This is poured over the whole cauliflower, some breadcrumbs are often sprinkled on top and then the whole thing is baked until golden brown and bubbling. Heaven, I tell you! 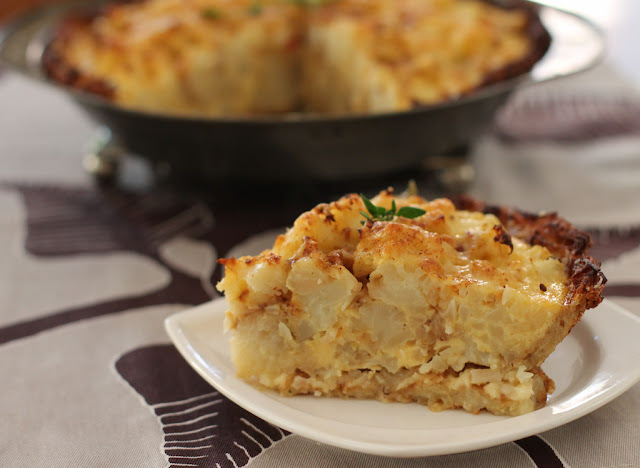 It's one of my husband's favorite dishes so it's on regular rotation at our house. Which brings me to today’s cauliflower cheese pie. It combines my love of cauliflower and cheese, with his baked British favorite and bonus, puts it all in a crunchy potato crust. Hope you love it as much as we do. Make sure to scroll down to the bottom where my Sunday Supper friends are sharing All The Pies, sweet and savory, with many thanks to our host today, Erica of The Crumby Cupcake. This recipe is adapted from "Moosewood Cookbook" by Mollie Katzen. Preheat the oven to 400°F 200°C. 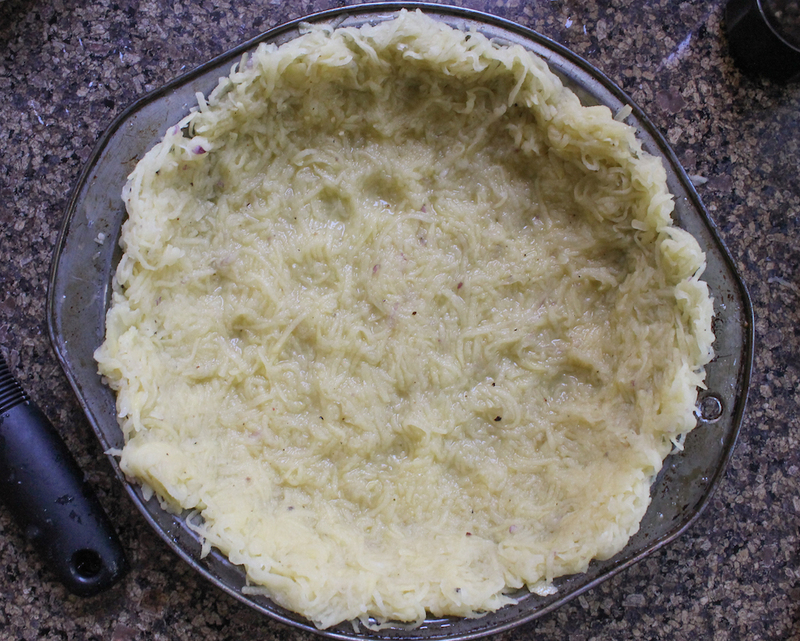 Grease a 9in or 23cm pie plate with a drizzle of olive oil. Whisk your egg white with the salt and a good few grinds of fresh black pepper. Peel and grate your potatoes. 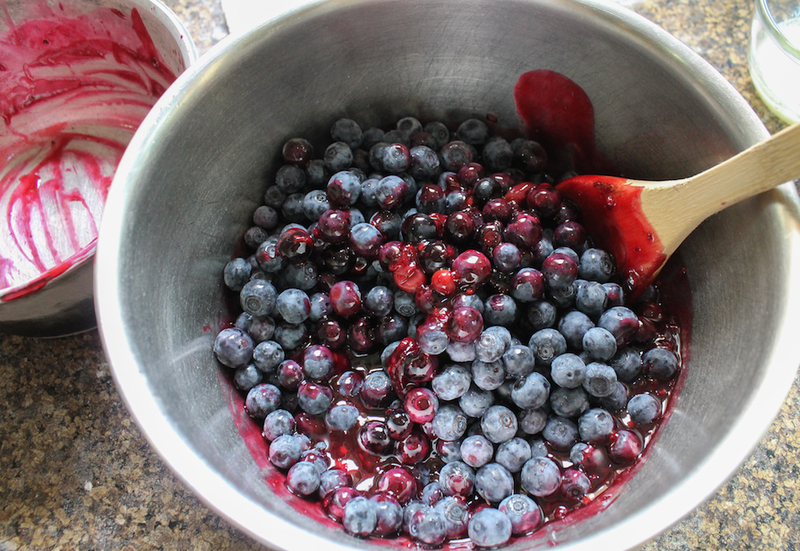 (Once again, I used the food processor.) Squeeze the liquid out and stir the grated potatoes into the egg white immediately to stop them from discoloring. 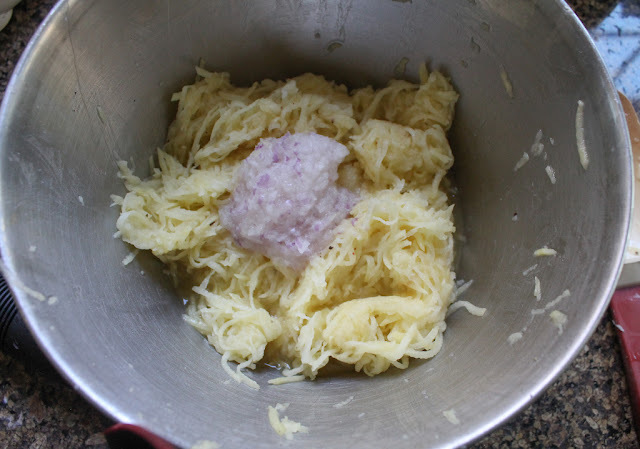 Grate your onion and add it to the potato mixture, stirring well to combine. Pour the grated potato mixture into the prepared pie plate and use your fingers to pat it down evenly to make a crust. It's going to seem quite wet, despite your squeezing the liquid out of the potatoes but don't worry. 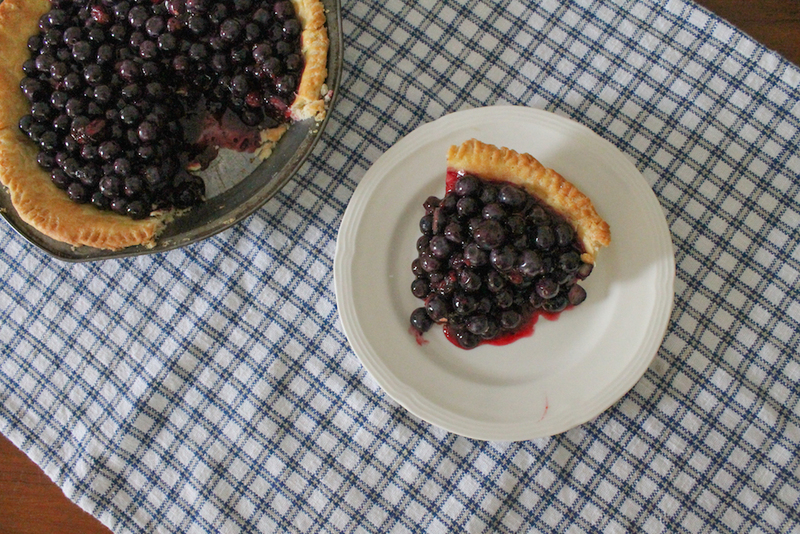 The moisture bakes away and the crust does get crunchy in the hot oven. 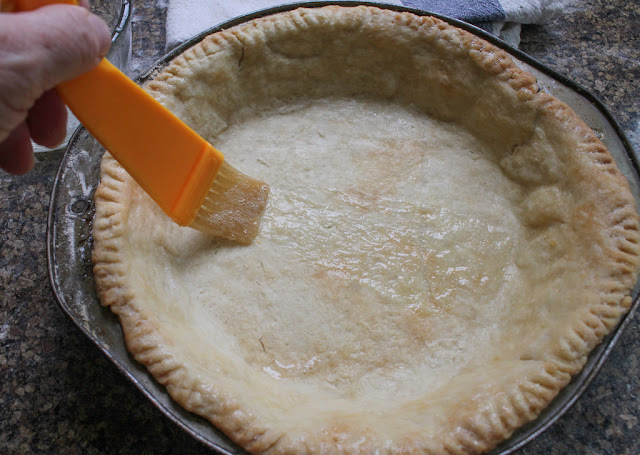 Bake the crust for 30 minutes in your preheated oven, then brush just up to the brown edge with a little olive oil (about 1 teaspoon) and bake for 10 more minutes. Remove the crust from the oven and turn the temperature down to 375°F or 190°C. 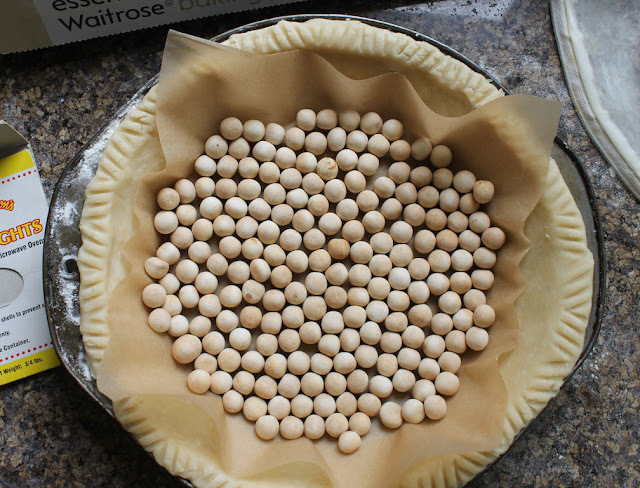 While the crust is in the oven, you can get on with the filling. Remove the leaves and hard stem from the head of cauliflower and cut the florets into bite-sized pieces. 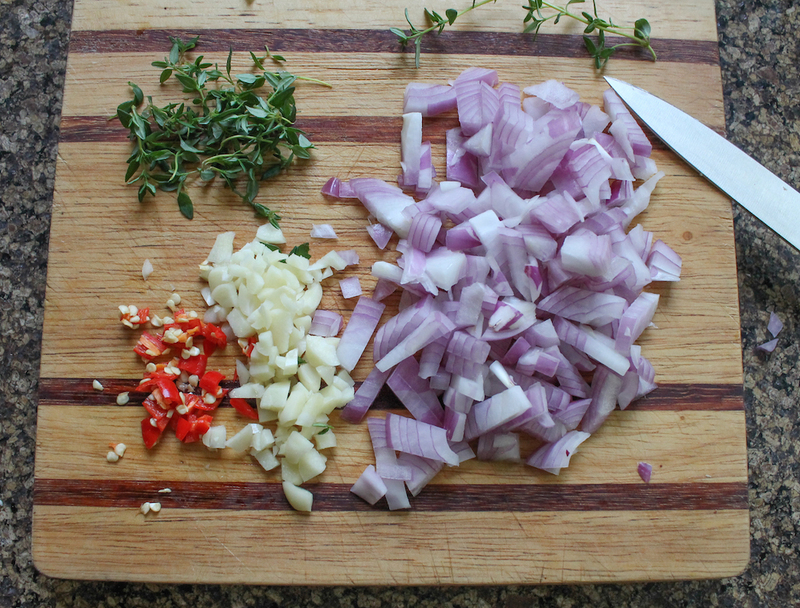 Chop your onion, mince the garlic and pepper and strip the leaves off of the fresh thyme sprigs. Save one sprig for garnish, if desired. Melt the butter in a large skillet. 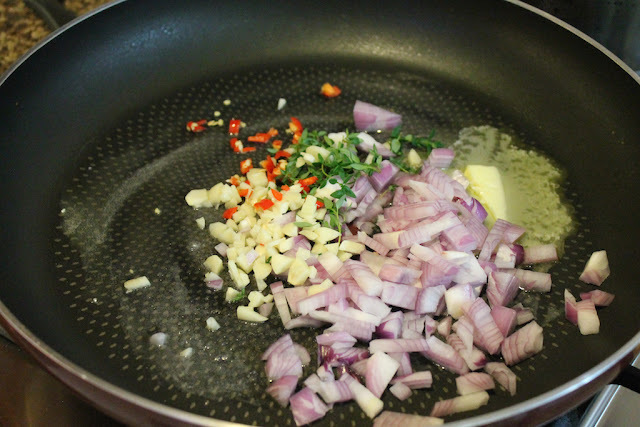 Add the onion, garlic, chili pepper, salt and thyme with a few good grinds of fresh black pepper, and sauté over medium heat for about 5 minutes. 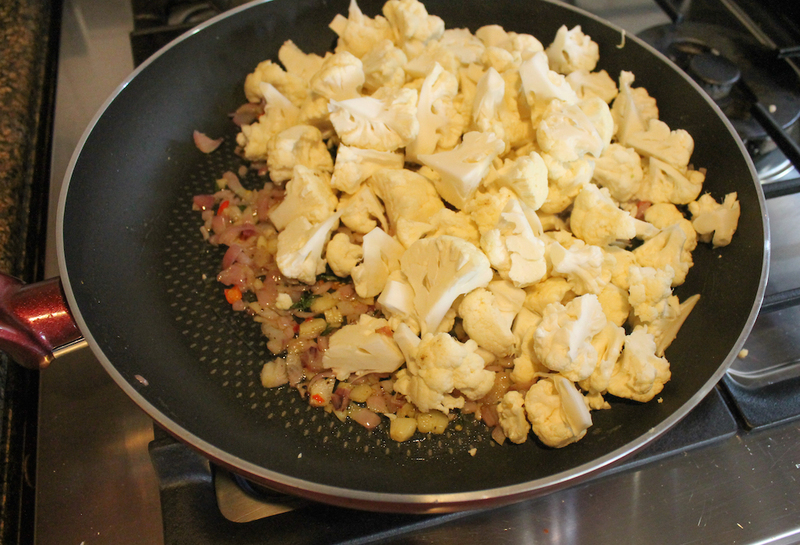 Add the cauliflower, stir, and cover. 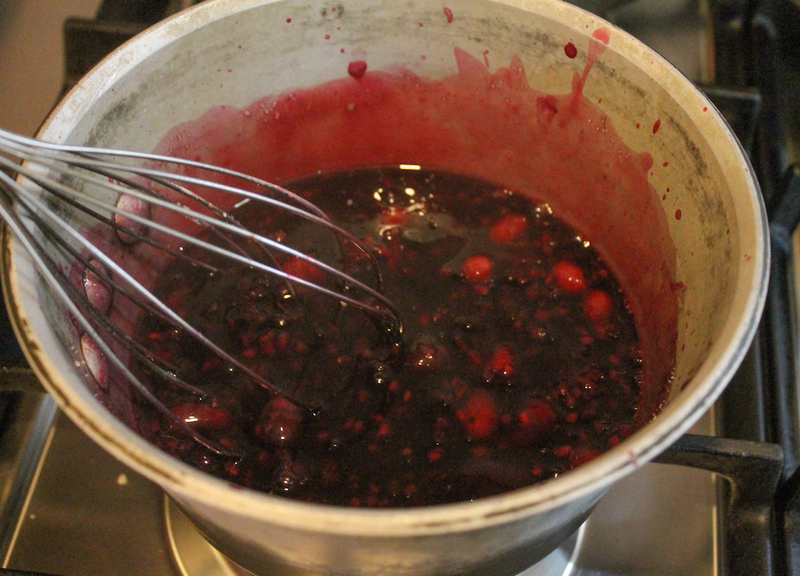 Cook until tender, stirring occasionally - about 8 to 10 minutes. 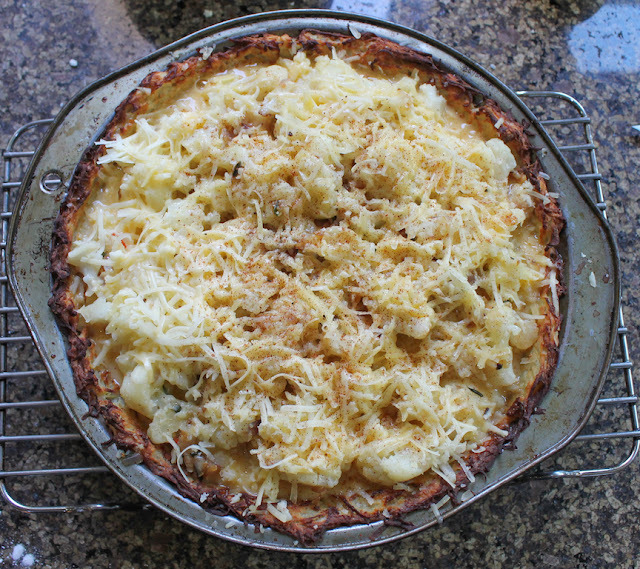 When the baked crust is ready, sprinkle half the grated cheese onto it. Spoon the sautéed vegetables on top, then top with the remaining cheese. Beat the eggs, egg yolk, milk and cornstarch together making sure the cornstarch has dissolved and pour this over the top. Dust lightly with paprika or cayenne. 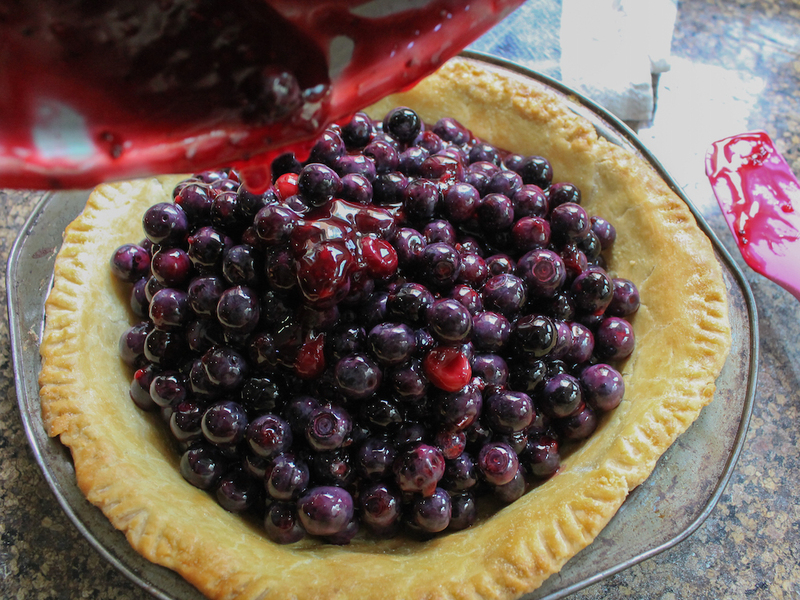 Bake for 35 to 40 minutes or until set. If you feel the edges are getting too brown before the pie is cooked through, cover them with some foil. and these special Portuguese custard tarts, baked in honor of our Sunday Supper leader, Isabel, just to name a few. 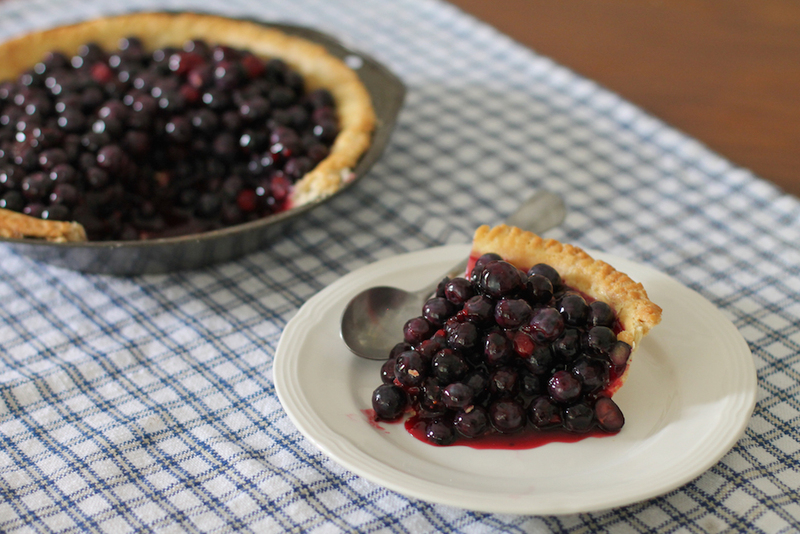 But make sure you don't miss this fabulous link list to the #SundaySupper Pies: Sweet & Savory! Roasting cabbage wedges before slicing them for coleslaw brings out the sweetness in this winter vegetable, which is further enhanced by the salty, spicy, slightly creamy bacon dressing. 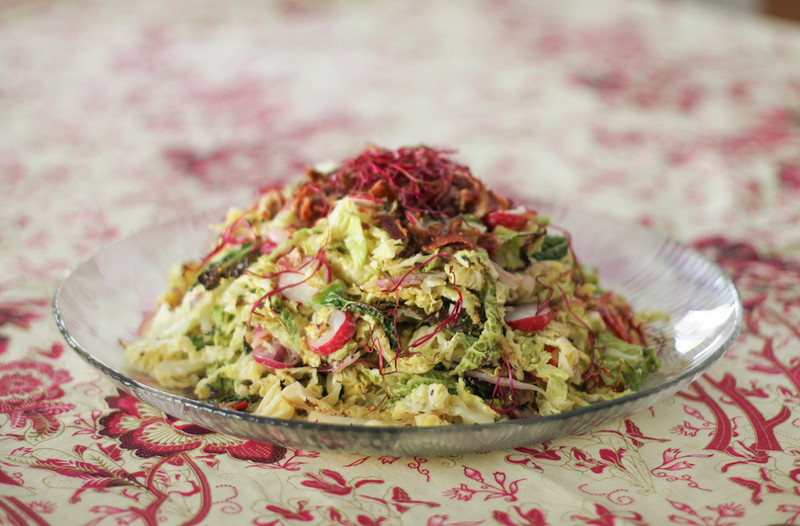 Best of all, this coleslaw can be made a day or two ahead. 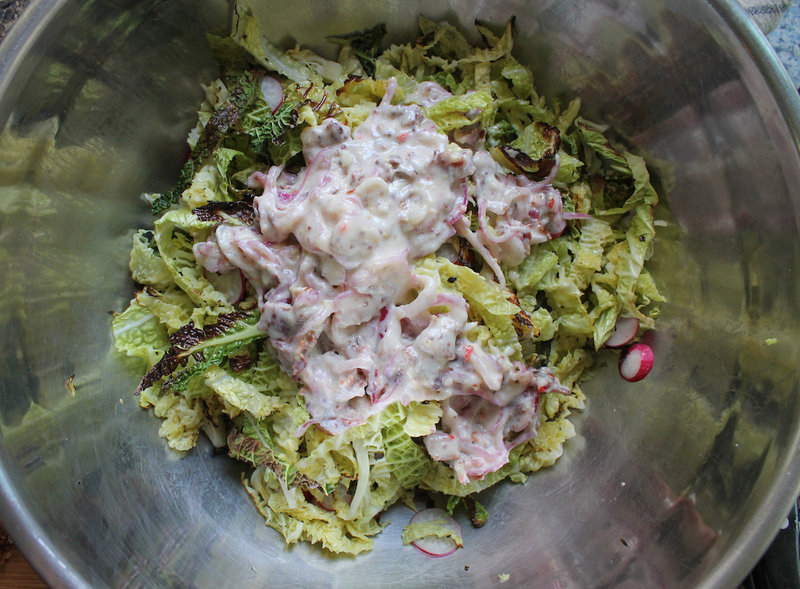 We eat a lot of salads in the summertime, especially since we moved to Dubai three years ago. With temperatures soaring it’s hard to think about turning the stove on unless it’s really, really necessary and something chilled and fresh like this Tuscan Bean Salad is the perfect dinner. As we head into Autumn, salads get heartier and we enjoy what the French called salades composées including this Sweet Potato French Bean Lentil Salad. 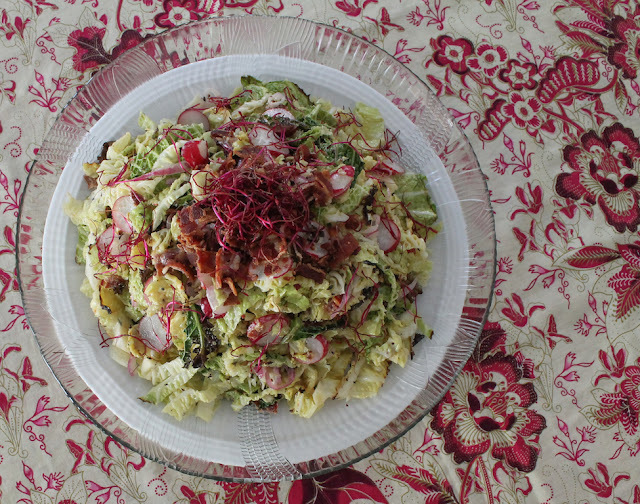 But even during winter here, salads are a favorite. They change complexion somewhat, with the addition of couscous or bulgur wheat, making them heartier and more sustaining. Or they feature winter vegetables like cabbage and Brussels sprouts. 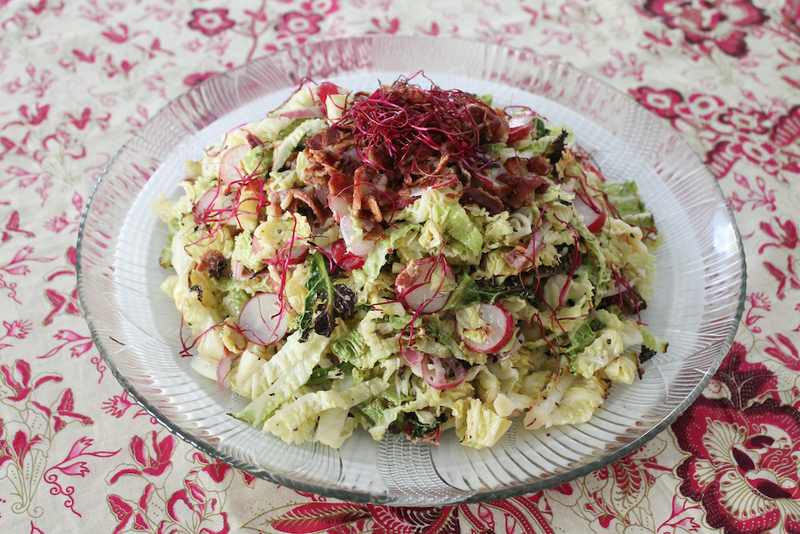 This week our Sunday Supper group is sharing winter salad recipes, hosted by super Sue of Palatable Pastimes. 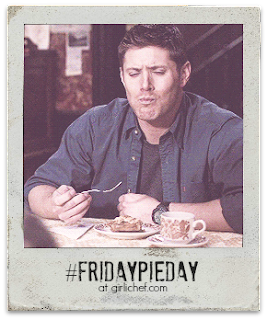 Make sure you scroll on down to the bottom to see all the great dishes we have for you today. Generous handful small red radishes – About 9 or 70g – Put more if you love them. 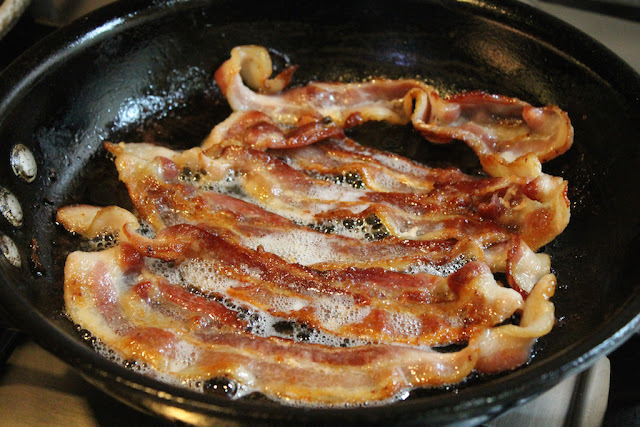 Fry the bacon until crispy and drain on some paper towels. 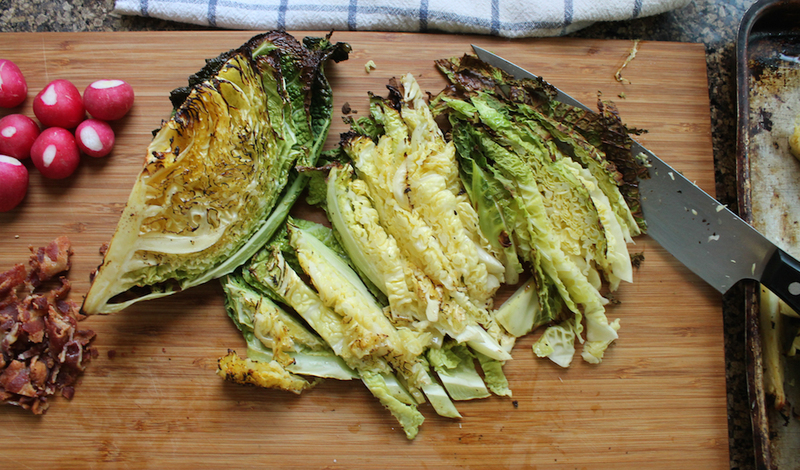 Set aside one tablespoon of the bacon fat for the dressing and save the rest for brushing on the cabbage before roasting. Cut the cabbage into six thick wedges and place them in a large baking pan. Brush the bacon fat on with a pastry brush. 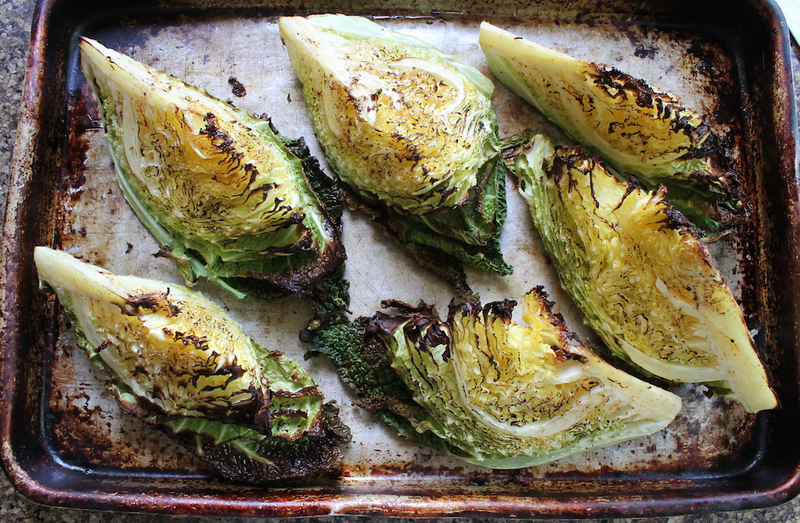 Roast the cabbage wedges in your hot oven for about 15-20 minutes or until the tops are turning brown. 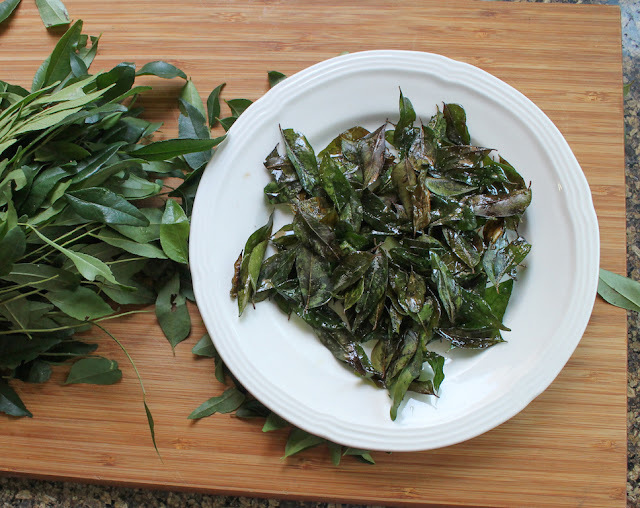 Some of the leaves on the bottom may get very dark. If they taste burnt when they come out, discard those bits. Mince your garlic and chili pepper and put them in a small bowl with the balsamic vinegar. You can remove the seeds of the pepper if you don’t like things too spicy, of course. I left mine in. Cut the onion in half and then slice it as thinly as you can. 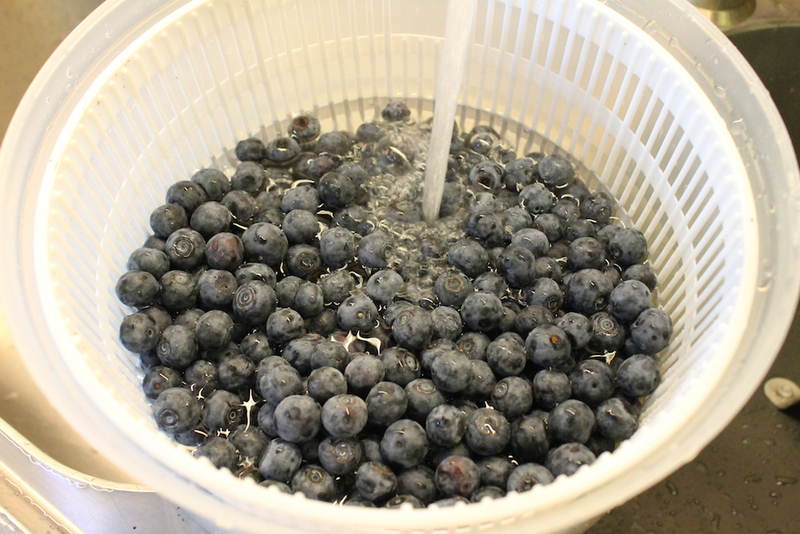 Add it to the vinegar bowl and stir. 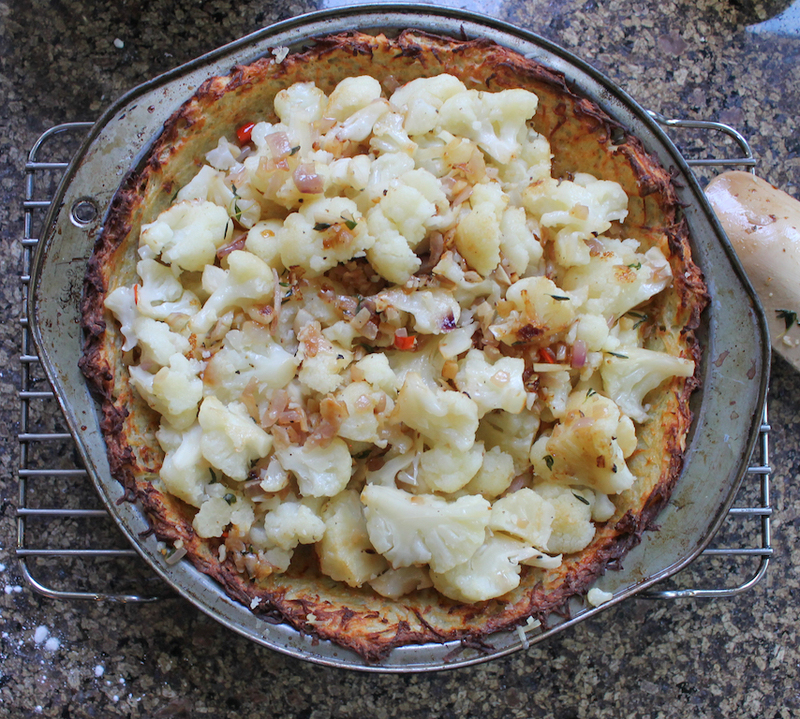 When the cabbage is out of the oven, set it aside to cool. 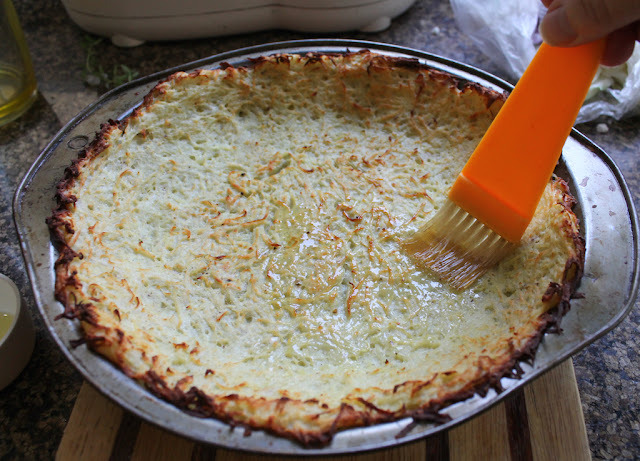 You want it to be browned on the edges, but still crunchy. 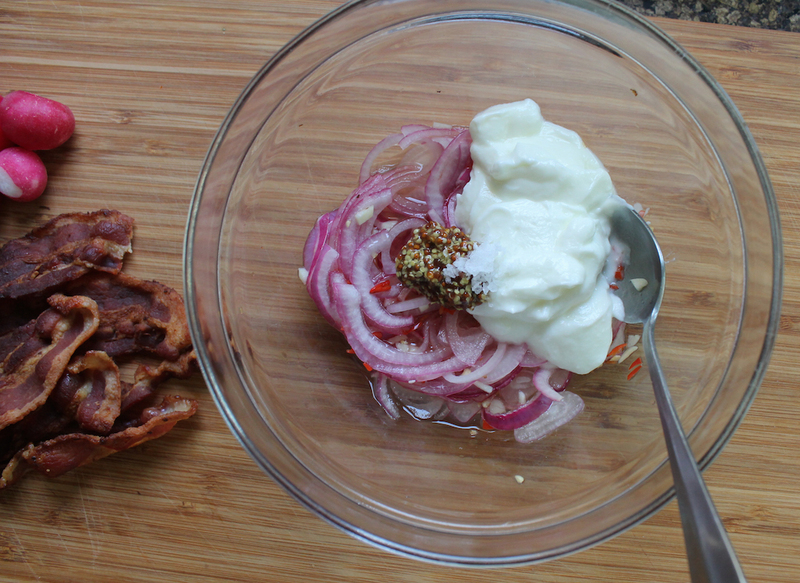 Add the yogurt and the mustard into the dressing, along with the salt, and stir well. Chop the bacon up, reserve a good handful for sprinkling on the coleslaw and add the rest to the dressing, along with the 1 tablespoon of bacon fat you set aside earlier and the olive oil. Mix well. 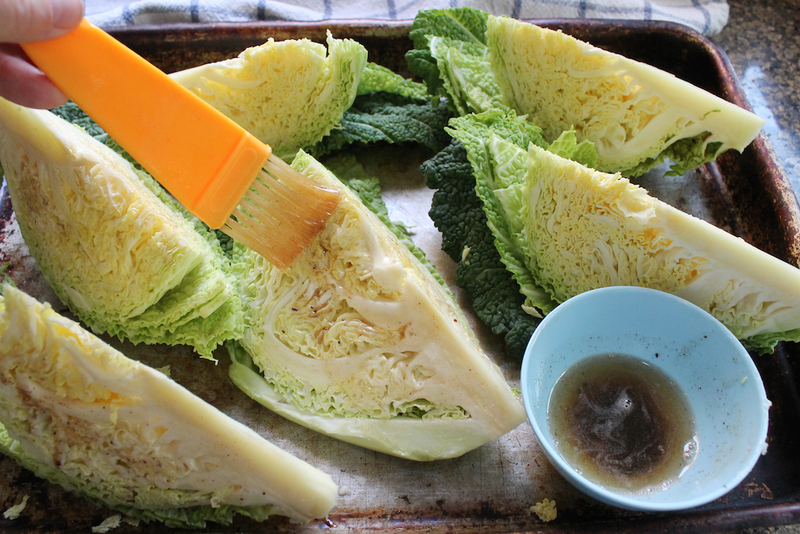 Once the cabbage is cool enough to handle, cut out the hard stalk in the middle and slice the wedges up into strips. Remove any thick ribs as you go along. You can share these with your furry helper, if he’s nearby. Vegetable lover that he is, mine is always right under foot when the cutting board comes out. Cabbage, you say? Don't mind if I do. 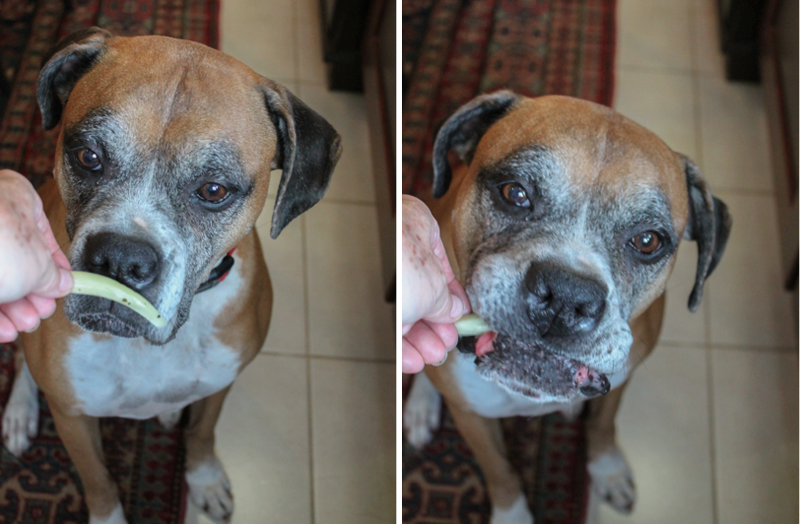 Cabbage is good for dogs! 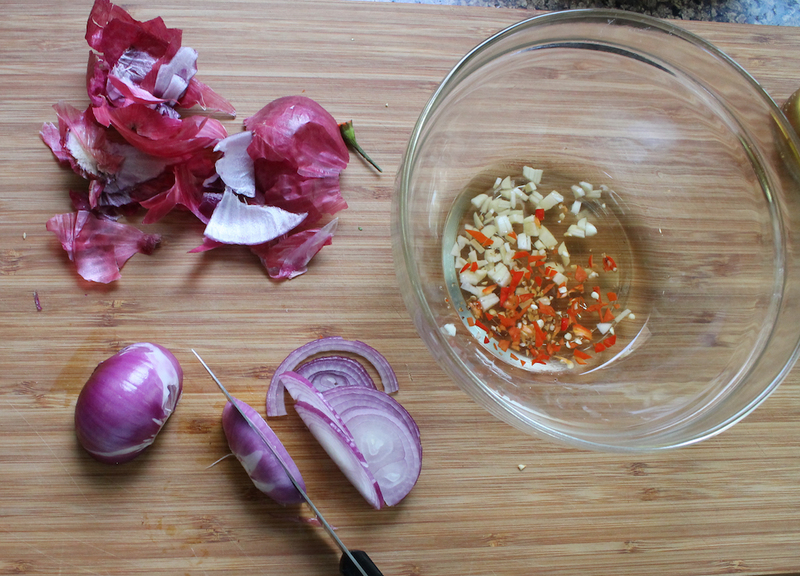 Remove the ends of the radishes and slice them into pretty white circles rimmed with pink. 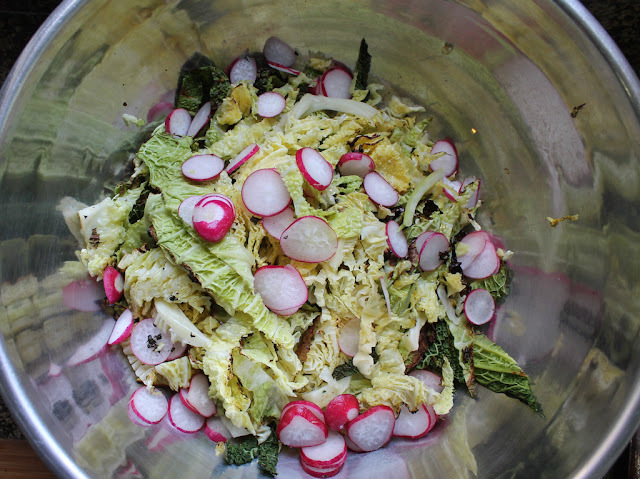 Pile the sliced cabbage and radishes into a large bowl with plenty of room for tossing. 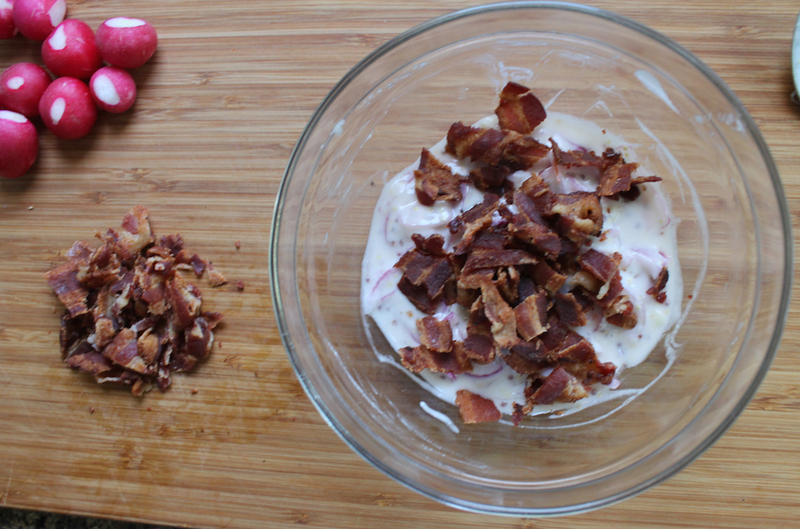 Add on the salad dressing and toss well to coat. Taste a piece or two and add a little sprinkling of salt, if necessary. 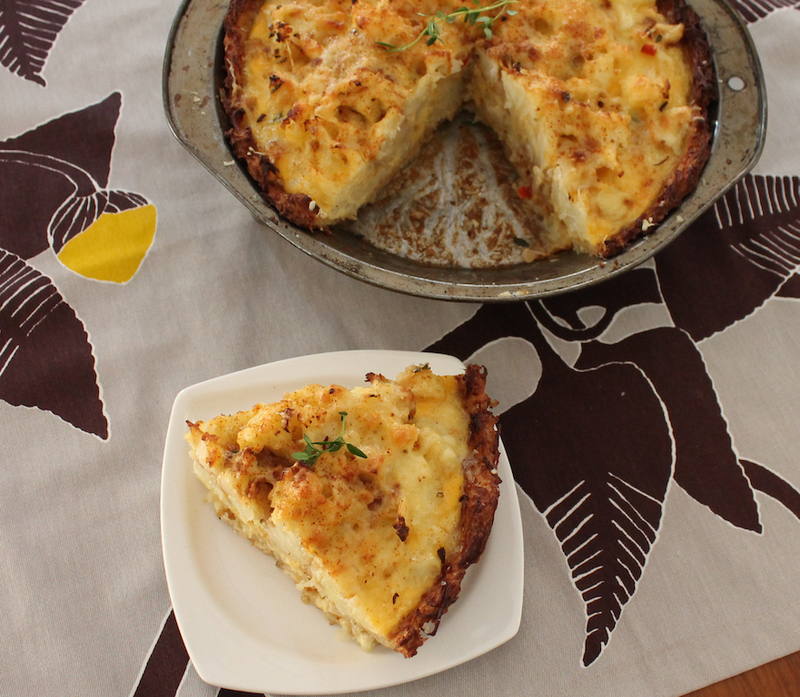 This can be served immediately or stored, tightly covered in the refrigerator for a day or two. When you are ready to serve, let the coleslaw warm up a bit, if it’s been refrigerated. Give it another good toss, plate it up then top it with the reserved bacon bits and some young beet sprouts, if desired. Are you a fan of winter salads too? Have we got a line up for you!